With a mid-range budget for bathroom radiators you’ll be overwhelmed with options. Not a bad thing, no, but it can make finding the perfect radiator to complement your beautiful bathroom difficult, and who likes difficult? As always, the WYB team are here to bring to your attention several bathroom radiators which are well worth considering with a budget of £100 - £300. Many bathrooms contain lots of ceramic and cool materials, such as tiles, brass, chrome and glass which means in the colder months of autumn and winter, a chilly bathroom can feel like the last place on earth you’d want to visit. A toasty bathroom on the other hand is a stark contrast and will make you feel cosy, warm and relaxed. This is why bathroom heating is so important, but the next priority after deciding on heating for your bathroom and your budget is which one you should buy. Whether you’re planning to buy a traditional bathroom radiator or a modern bathroom radiator, you’ll certainly have lots to choose from with a £100 - £300 budget. You’ll find a lot more branded items too, so if you’re wanting something super-stylish then our designer radiators range may just have what you’re looking for. 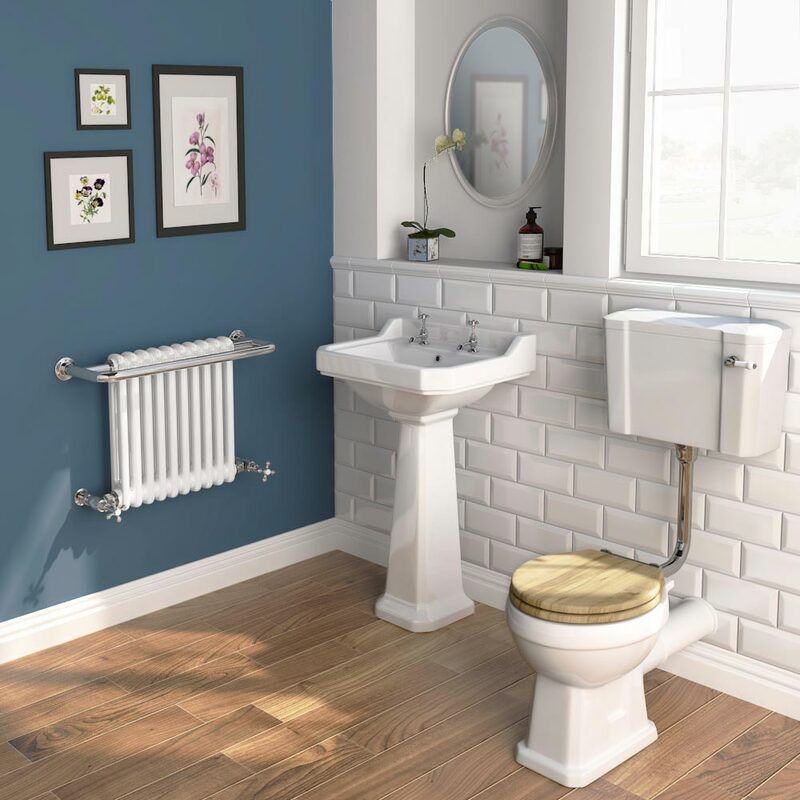 Traditional radiators are ideal for creating a period look; a traditional bathroom design will certainly be complemented by a radiator from this range. Options within this range include traditional towel rails and column radiators; a traditional towel radiator combines both styles in one which have proven extremely popular. Don’t let these old fashioned radiators fool you though as they compete well with their contemporary counterparts and feature lots of mod cons to help reduce energy wastage whilst outputting some serious heat too. 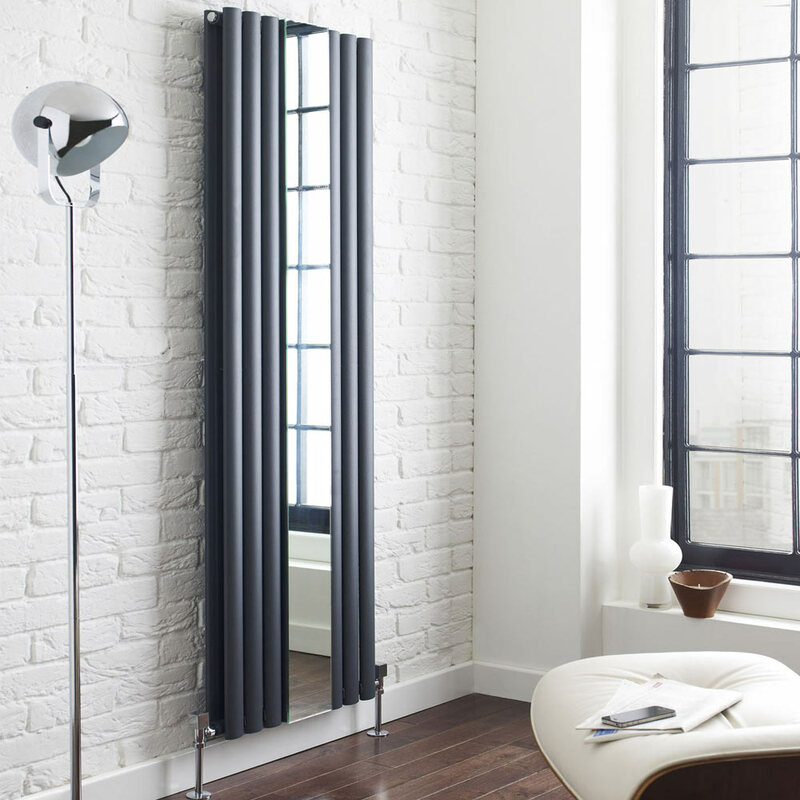 Modern radiators offer a stylish and comfortable addition to contemporary bathrooms. Turn up the heat in your bathroom with an electric towel rail or shop our designer range for vertical radiators and horizontal designer radiators which come in a variety of colours to revamp your room. For something a little different, take a look at these flat panel radiators which create a clean, minimalist look in contemporary settings. So, you should now have an idea about what sort of radiator you’re looking for. Let’s take a look at hottest 5 we could find for you! Create a wonderfully traditional look in your bathroom, cloakroom or kitchen with this stunning traditional radiator. 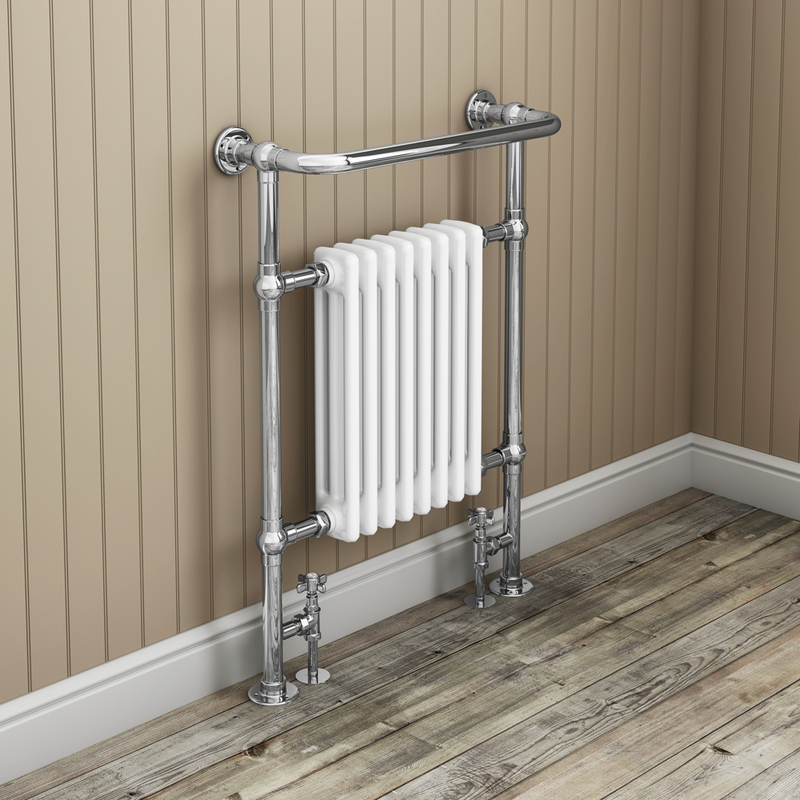 It comes complete with radiator valves and features chrome legs and surround with a white column radiator in the middle. What could you buy with the change? There’s lots of change remaining from a £300 budget so why not consider retiling your bathroom with new tiles? 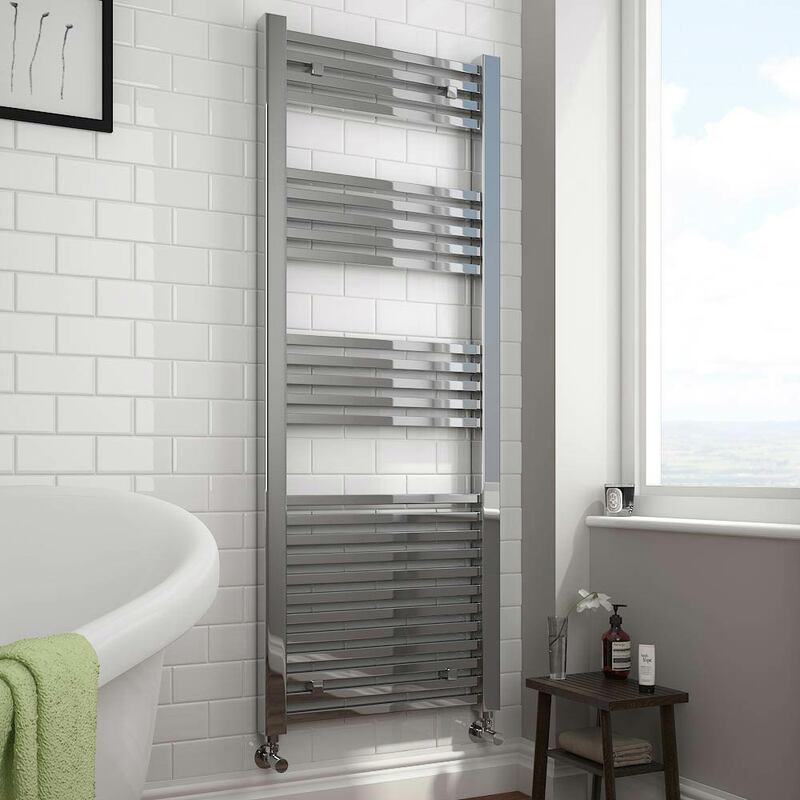 Add a stylish, modern look and feel to any bathroom or kitchen with a stunning ladder heated towel rail. 26 heated chrome tubes make up this gorgeous vertical radiator (pictured above) and create 4 sections which allow you to store and dry numerous large towels. What could you buy with the change? With all of that change remaining from your budget you'll be able to get yourself some of these stylish angled radiator valves? The oval shaped anthracite columns of this vertical radiator create a luxury feel that will really turn heads. The full length design is hard to ignore yet site elegantly against the wall of almost any room. Subtly placed in the middle of the radiator is a full length mirror which helps reflect light and offers a practical area where you can do those final checks before you leave the room. What could you buy with the change? Grab a set of modern anthracite radiator valves with the change from your budget and you'll create a seamless finish. This stunning wall hung bathroom radiator is sure to add plenty of classic style to any traditional bathroom or cloakroom. The white column radiator design is surrounded by stainless steel rails and tubing to help hang and dry towels. Finished in polished chrome it'll look amazing when mounted on your wall. What could you buy with the change? This bathroom radiator can be had for almost half your budget so you'll have plenty change to buy these stunning traditional angled radiator valves. You'll also have enough left to add some white metro tiles to really enhance your room. Adding colour to your bathroom can fill it with character, but with this designer radiator from Hudson Reed will also add luxury too. 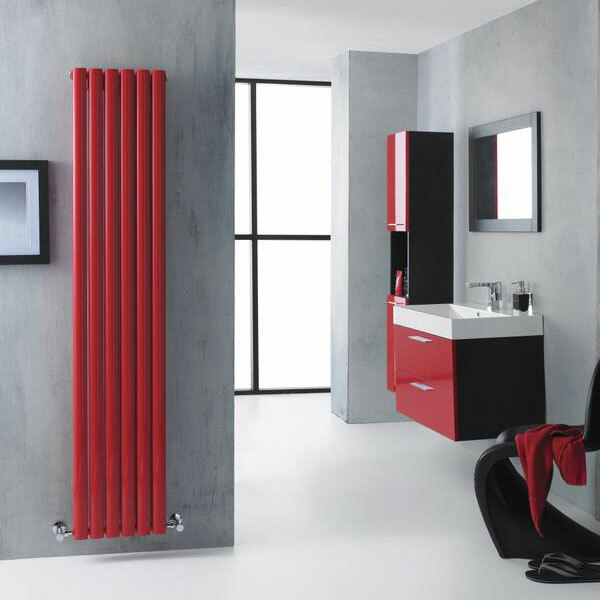 This stylish vertical radiator is red-hot right now and can work alongside red bathroom furniture and accessories as well as darker shades including black and grey. What could you buy with the change? With so much budget remaining when you buy this designer radiator, you'll have enough left to grab these minimalist chrome radiator valves. You'll also have enough left to add some more red bathroom accessories to really bring in the colour to your bathroom. As you can see from all of our options above, bathroom radiators don't have to be boring. These stylish radiators can totally enhance your bathroom, cloakroom, kitchen and even the living room, especially when you choose a designer radiator. Just remember that not all radiators come with valves and as we've mentioned, you'll need to factor the cost of radiator valves into your budget. For those on a budget and who love a great deal we also have cheap horizontal and vertical radiators in our sales! 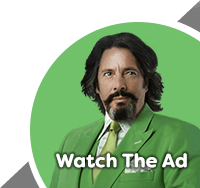 Take a look at them if you want to make huge savings. Another thing to remember to check is the BTU Rating. Simply put, the BTU Rating of a bathroom radiator is the level of heat output from your radiator. BTU stands for British Thermal Unit. What is this? You ask. Well, imagine you want to heat one pound of water by one degree fahrenheit. if your container of water was a temperature of 1­° F, it would require 1 British Thermal Unit to heat that body of water to 2° F. For more information on BTU ratings read our guide. If you're still in need of some good ol' inspiration then why not have a look at these great bathroom heating ideas. We really hope you found this recent WYB edition helpful when getting your bathroom ready for these colder month's that are creeping in. If you think somebody you know may find this helpful please feel free to share it with them. What Is The Best Toilet Seat To Buy? We take a look at all the many different types of toilet seats available to help you choose the best one to buy for your toilet.